This is the story of Hermitage. It begins with a loner knight, Gaspard de Stérimberg, who settled in the mountains of the northern Rhone. Returning home, tired from fighting Arabs, he decided to get drunk on Syrah. Legend says that these hills of the northern Rhone were named after the old hermit. 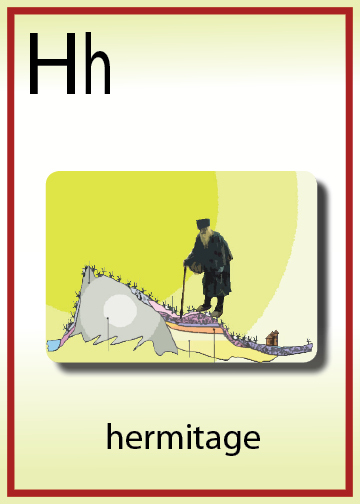 Today the vineyards bare the name HERMITAGE. The southern facing hills of the Hermitage are made of granite slopes at an extreme vertical. The vines gripping onto these slopes are stressed to find water and baked by the rays of the southern sun. I would imagine that since the Hermit sat a top of these mountains, his skin was as black as the Syrah growing beside his cave. Prior to the hermits arrival, the Romans were delighted by the Hermitage. They had planted the vineyards into the hills overlooking the Rhone River. These wines gained rapid acknowledgement throughout the empire. Over the centuries, the vineyards continued receiving praise from around the world as producing some of the best wines in the world. So much so, that Bordeaux would blend their wines with Hermitage to improve their quality. A process they called “Hermitagé” my wine. Kind of like MTV’s “Pimp my Ride”. The wines of Hermitage are made of Syrah and Marsanne. These wines are not for the weary at heart. They are masculine wines that need time to age. I guess you can say they take after their supposed founder, the rugged Hermit who sought solitude only to become world famous.